According to the U.S. Consumer Product Safety Commission, an estimated 260 children under five years of age drown each year in residential swimming pools and spas. The Commission estimates that another 3,000 children under age five are treated in hospital emergency rooms following submersion accidents each year. Some of these submersion accidents result in permanent brain damage. Nationally, drowning is the fourth leading cause of death in children under five. In some states such as California, Florida, and Arizona, drowning is the leading cause of accidental death in children under five. As with most child safety measures, keeping your kids safe in the water starts with proper supervision. That means watching your kids when they are in or around water, even if they know how to swim. Remember that swim lessons don't make kids, especially younger kids, drown proof. 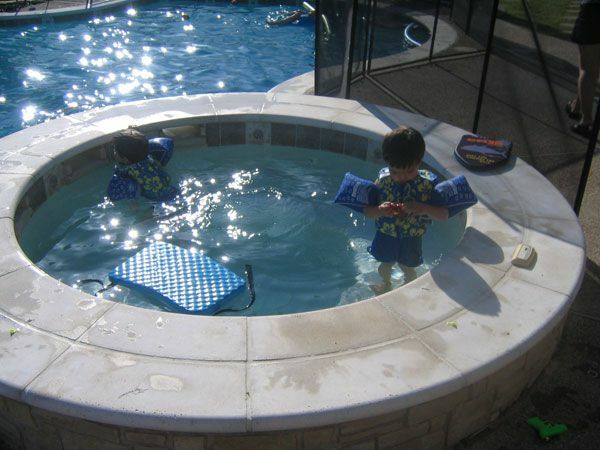 Childproof your swimming pool so that it is enclosed by a permanent fence (which is better than a removable pool fence) that has a self-closing and self-latching gate that is difficult for younger children to open. Also, make sure that your child can't easily get out of your house to the pool area. That way, you have a "layers of protection" system and if one safety layer breaks down, such as someone leaves the gate to the pool open, your child still can't get out to the pool. Have everyone wear Coast Guard-approved life jackets, and not just floaties, on boats, jet skis, and on other personal watercraft. Only let kids dive in areas that are clearly marked for diving or when you know how deep the water is. Only swim in designated areas in the ocean and are aware of how to escape rip currents, which can pull you out to sea, by swimming parallel to the beach (sideways), until you are out of the rip current and can swim back to shore. Apply sunscreen or sunblock on your children at least 15 to 30 minutes before going out in the sun to avoid sunburn, and then reapply it at least every two hours, especially if your child has been in the water. Also, be sure to have a phone nearby so that you can quickly call for help if necessary.